Bert Dodson is a painter, teacher, author and illustrator. He has illustrated over 80 books for children. He has authored two books on drawing; Keys to Drawing (North Light, 1985), and Keys to Drawing with Imagination (North Light, 2006). In the 1980’s he created the political comic strip, Nuke, which was published in two volumes, as Nuke; A Book of Cartoons (McFarland and Company, Jeffersonville, NC, 1988), and Nuke II; Another Book of Cartoons (1990). He co-authored, with the biologist, Mahlon Hoagland, The Way Life Works (Times Books, 1995), and Intimate Strangers; The Story of Unseen Life on Earth (ASM Press, 1999). Bert was animation designer for the four part PBS television series, Intimate Strangers (1998). He regularly exhibits his watercolors and drawings and for several years has been illustrating Opera Stories for Children, a series commissioned by The New York Metropolitan Opera. Bert resides in Vermont. 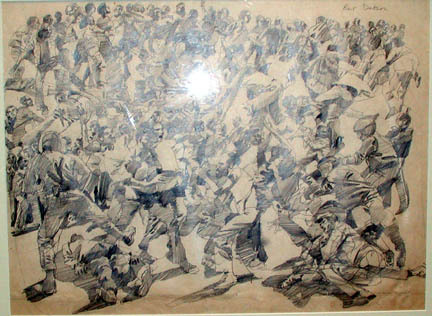 Dodson, Bert, “Rioting Crowd,” Westport Public Schools Digital Collections, accessed April 25, 2019, https://collections.westportps.org/items/show/1061.